What did you like about the book? A young tiger happens upon a group of animals gathered together in the forest, reciting “Bunnies, Bunnies burning bright, in the forests of the night-” He says “Excuse me, that’s not how it goes. It’s ‘tiger, tiger burning bright, in the forests of the night.’’ The animals keep telling him that, no, here it is bunnies. “That’s ridiculous! The poem is about…Me! The most feared animal in the forest.’’ When all the animals look for hiding places, the tiger cannot believe it. What on earth can be scary about a bunny? Super colorful, very bright and large two-page illustrations done with digital brushes, pencils, pastels and charcoals and outlined in black make this a very, very cute story. The expressions of perplexity on the tiger are worth reading for that alone. The original poem, The Tyger by William Blake, is printed on the inside back cover. Anything you did not like about the book. Young children will not understand the reference to the theme of this book, “Tiger, Tiger Burning Bright” but The Tyger by William Blake is included and can be read to them. 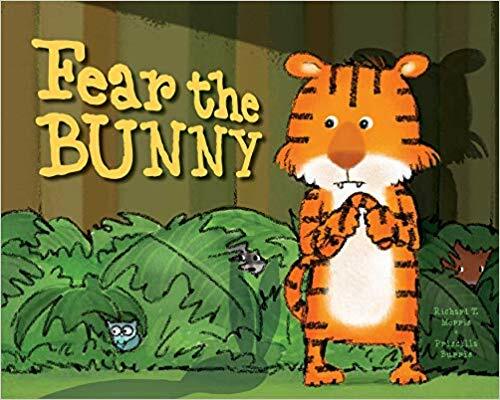 It may not be necessary, however, as I’m sure children view tigers as scarier than bunnies. To whom would you recommend this book? This would make a great readaloud for storytimes, especially those that are animal-themed. Should we (librarians) put this on the top of our “to read” piles? For its cuteness, silliness and funniness, yes. This entry was posted in *Starred Review, Book Review and tagged Caitlyn Dlouhy Books, Simon and Schuster Books for Young Readers. Bookmark the permalink.